Tasman Rosenfeld receives accolades from Elaine Hansen, executive director of the Center for Talented Youth (CTY). 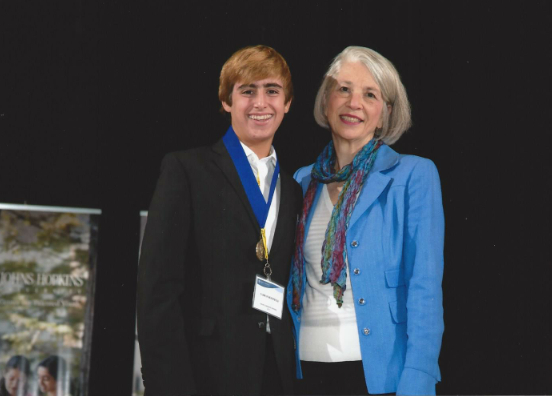 Tasman Rosenfeld, an 8th grade student at Grandview Preparatory School, was honored in October as one of the brightest middle school students in the world at a national awards ceremony sponsored by the Johns Hopkins University Center for Talented Youth (CTY) in Baltimore. The Center honored Tasman for his exceptional performance as a middle school student on the college SAT as part of the 2012-2013 CTY Talent Search. CTY uses above-grade-level tests (such as the college SAT for middle school students) because they provide a clear picture of advanced students’ academic abilities. This year there were more than 35,700 second-through-eighth grade participants in the CTY Talent Search, which identifies and recognizes the academic capabilities of advanced students around the world. Students from 50 states and 69 countries participated in the 2012-2013 Talent Search. Of the 17,670 seventh and eighth grade participants in the 2012-13 CTY Talent Search, only 1,075 U.S. and international middle school students scored high enough on their above-grade-level tests to be invited to the ceremony on the Johns Hopkins University campus. Students honored at the 2013 Grand Ceremony qualified for CTY’s residential summer programs, online classes, and family academic programs. At CTY, academically advanced students–who come from some 100 countries around the world–meet others like them and form a community of learners. Every year, more than 9,400 bright, pre-college students participate in CTY summer programs, which are held at 24 sites in the United States and Hong Kong on campuses ranging from Johns Hopkins and Princeton to Stanford and Berkeley. Another 13,300 students take CTYOnline courses annually, and more engage in family programs. Tags: Center for Talented Youth, John Hopkins University. Bookmark the permalink.